This definitive in-world guide to the Marvel Comics Universe features, in chronological order, every significant Marvel Comics character, location, vehicle, and weapon in the company's illustrious history. Go on a fact-and fun-filled journey via the first major Marvel heroes, villains, cowboy stars, and comic characters of the 1940s and 1950s to the iconic, timeless Super Heroes and Super Villains of the Marvel Age of the 1960s and beyond, such as Thor, Hulk, Spider-Man, Doctor Strange, Iron Man, the Avengers, Loki, and Green Goblin. Further sections feature key vehicles and technology, magical artifacts, planets, countries and places, plus a glimpse behind the scenes into Marvel Comics' creative processes and techniques. 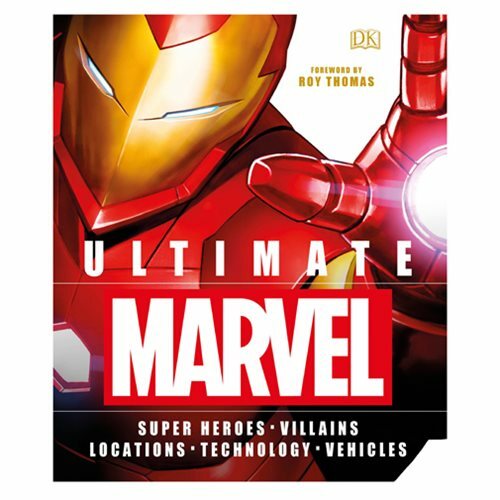 The Ultimate Marvel: Super Heroes Villains Locations Technology Vehicles Hardcover Book has 320 pages.